سعادت, محمد, اصفهانیان, محسن, بهبهانی, سعید. (1395). بهینه‌سازی مصرف‌ سوخت قطار‌ دیزل-الکتریک با استفاده از کنترل فازی آینده‌نگر. پژوهشنامه حمل و نقل, 13(1), 53-63. محمد سعادت; محسن اصفهانیان; سعید بهبهانی. "بهینه‌سازی مصرف‌ سوخت قطار‌ دیزل-الکتریک با استفاده از کنترل فازی آینده‌نگر". پژوهشنامه حمل و نقل, 13, 1, 1395, 53-63. سعادت, محمد, اصفهانیان, محسن, بهبهانی, سعید. (1395). 'بهینه‌سازی مصرف‌ سوخت قطار‌ دیزل-الکتریک با استفاده از کنترل فازی آینده‌نگر', پژوهشنامه حمل و نقل, 13(1), pp. 53-63. سعادت, محمد, اصفهانیان, محسن, بهبهانی, سعید. بهینه‌سازی مصرف‌ سوخت قطار‌ دیزل-الکتریک با استفاده از کنترل فازی آینده‌نگر. پژوهشنامه حمل و نقل, 1395; 13(1): 53-63. قطارهای دیزل-الکتریک یکی از مهمترین ارکان صنعت حمل و نقل محسوب می‌شوند و بخش قابل توجهی از مصرف سوخت را به خود اختصاص می دهند.. یکی از عوامل موثر در میزان مصرف سوخت این وسیله‌نقلیه، نحوه شتاب‌گیری و ترمزگیری یا به عبارت دیگر، منحنی تغییرات سرعت قطار با زمان می‌باشد. هر چند روش‌های عددی موجود در محاسبه منحنی بهینه سرعت، نتایج قابل‌قبولی را بدست می‌دهند، و لیکن استفاده از این روش‌ها در انجام محاسبات، امری بسیار زمانبر خواهد بود. به منظور کاهش زمان محاسبات، استفاده از منطق فازی به عنوان یک روش کارآمد مورد توجه واقع شده است. 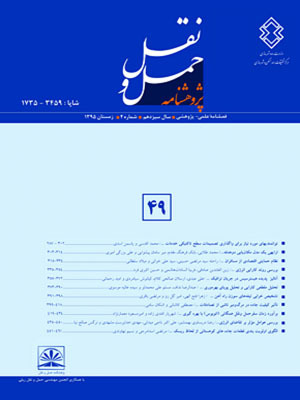 در مقاله حاضر رویکرد کنترل فازی آینده‌نگر جهت بهبود مصرف‌سوخت قطار دیزل-الکتریک به‌کارگرفته شده‌است. یک کنترل‌کننده فازی با در نظر گرفتن شیب مسیر پیش‌رو، برای تغییرات سرعت تصمیم‌گیری می­نماید. بدین ترتیب یک منحنی تغییرات نزدیک به منحنی تغییرات سرعت بهینه به‌دست خواهد آمد.مضافا با آنالیز حساسیت پارامترهای کنترل آینده‌نگر پیاده‌سازی‌شده، عملکرد الگوریتم کنترل بهبود داده شده است. نتایج شبیه‌سازی نشان می‌دهد که درصورت پیاده‌سازی الگوریتم توسعه داده شده، مصرف سوخت قطار به میزان7/2 درصد کاهش خواهد یافت. Diesel-electric locomotives are one of the foremost elements of transportation systems and they consume significant portion of transportation fuel usage. One of the effective parameters in fuel consumption of these vehicles is acceleration and braking strategy according to train speed profile. Although the available numerical methods for calculating the optimal speed profiles present acceptable results, the use of these methods in the calculation is too time-consuming. To reduce the computation time, using fuzzy logic as an efficient method has been suggested. In this paper, a fuzzy look-ahead control approach is implemented to optimize fuel consumption of diesel-electric locomotives. A fuzzy controller will decide the speed changing by considering the gradient of the path ahead. Hence, a speed profile close to optimal speed profile will be achieved. Furthermore, the performance of control algorithm has been improved by a sensitivity analysis of look-ahead controller parameters. The simulation results of developed algorithm show that at least 2.7 percents reduction in fuel consumption of diesel-electric locomotives can be achieved. - مهدی نژاد، م. (1385) "اطلاعات حمل و نقل و انرژی کشور سال1385"، شرکت بهینه سازی مصرف سوخت، ص8-2. - Howlett. P (1990) “An optimal strategy for the control of a train”, J. Australian Math. Soc., Ser. B, vol. 31, no. 4, pp. 454–471. - Cheng. J, Howlett. P (1992) “Application of critical velocities to the minimization of fuel consumption in the control of trains”, Automatica, vol. 28, no. 1, pp. 165–169. - Pudney. P, Howlett. P (1994) “Optimal driving strategies for a train journey with speed limits”, J. Australian Math. Soc., Ser. B, vol. 36, no. 1, pp. 38–49. - Howlett.P, Milroy.I, Pudney.P (1994) “Energy-efficient train control”, Control Engineering Practice, vol.2, no.2, pp. 193_200. - Howlett. P, Pudney. P (1995) “Energy-efficient train control”, In Advances in industrial control. London: Springer. - Howlett. P (1996) “Optimal strategies for the control of a train”. Automatic, vol.32, no.4 pp. 519_532. - Howlett. P, Cheng. J (1997) “Optimal driving strategies for a train on a track with continuously varying gradient”, The ANZIAM Journal, vol. 38, pp. 388-410. - Cheng. J, Davydova. Y, Howlett. P, Pudney. P (1999) “Optimal driving strategies for a train journey with non-zero track gradient and speed limits”, IMA Journal of Management Mathematics, vol. 10, pp. 89-115. - Howlett. P (2000) “The optimal control of a train”, Annals of Operations Research, vol. 98, pp. 65_87. - Khmelnitsky. E (2000), “On an optimal control problem of train operation”, IEEE Transactions on Automatic Control, vol. 45, no.7, pp. 1257-1266. - Howlett. P, Leizarowitz. A (2001) “Optimal strategies for vehicle control problems with finite control sets”, Dynamics of Continuous, Discrete and Impulsive Systems, B: Applications & Algorithms, vol. 8, pp. 41-69. - Liu. R., Golovitcher. I. (2003) “Energy-efficient operation of rail vehicles”, Transportation Research Part A: Policy and Practice, vol. 37, pp. 917-932. - Howlett. P, Pudney. P, Vu. X (2009) “Local energy minimization in optimal train control”, Automatica, vol. 45, pp. 2692-2698. - Hellström. E, Ivarsson. M, Åslund. J, Nielsen. L (2009) “Look-ahead control for heavy trucks to minimize trip time and fuel consumption”, Control Engineering Practice, vol.17, no.2, pp. 245-254. - Ganji. B, Kouzani. A (2010) “A Study on look-ahead control and energy management strategies in hybrid electric vehicles” 2010 8th IEEE International Conference on Control and Automation Xiamen, China. - Sahlholm.P, Johansson.P (2010) “Road grade estimation for look-ahead vehicle control using multiple measurement runs”, Control Engineering Practice, vol. 18, pp. 1328–1341. - Ganji. B, Kouzani. A, Hessami. M (2011) “Backward modeling and look-ahead fuzzy energy management controller for a parallel hybrid vehicle”, Control and Intelligent Systems, Vol. 39, No. 3. - Khayyam. H, Nahavandi. S, Hu. E, Kouzani. A, Chonka. A, Abawajy. J, Marano. V, Davis. S (2011) “Intelligent energy management control of vehicle air conditioning via look-ahead System”, Applied Thermal Engineering, vol. 31, pp. 3147-3160.